In my posts Objective reality as an asymptote and On truth: we can distinguish between false and falser (and discussions that followed those posts - mainly in my LinkedIn group) I shared my views on the difference between reality and our interpretation of it. Summarizing my thinking about this: I argue against: 1) saying that reality does not exist, 2) saying that reality is unknowable to us, 3) saying that we should not bother trying to refine our understanding of reality, 4) saying that there is no sense in trying to distinguish between the validity of one truth claim and another, and 5) calling one's view on the world 'one's truth' (and therefore saying that everyone has his own truth and that everyone's truth is equally valid). I argue for: 1) thinking about the truthfulness of our views and claims in continuous terms (not in dichotomous terms), 2) viewing reality as an asymptote which we can approach, 3) distinguishing between our interpretations/models of reality and reality itself, 4) acknowledging the limitations in what models we have developed, 5) explicitly acknowledging the difference between claims which fits reality worse (false claims) and claims which fit reality better (less false claims). 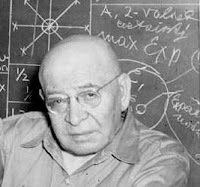 My interpretation of the famous "the map is not the territory" remark by Alfred Korzybski (picture) describes this well. He said "the map is not the territory", by which he meant that an abstraction derived from something, or a reaction to it, is not the thing itself. Korzybski held that many people confuse maps with territories, i.e. confuse models of reality with reality itself. This describes very well what I meant. Gregory Bateson said the following about this: "We say the map is different from the territory. But what is the territory? Operationally, somebody went out with a retina or a measuring stick and made representations which were then put on paper. What is on the paper map is a representation of what was in the retinal representation of the man who made the map; and as you push the question back, what you find is an infinite regress, an infinite series of maps. The territory never gets in at all. […] Always, the process of representation will filter it out so that the mental world is only maps of maps, ad infinitum. Bateson also added another interesting dimension to this discussion by saying that the usefulness of a map (a representation of reality) is not necessarily a matter of its literal truthfulness, but its having a structure analogous, for the purpose at hand, to the territory. Good points, and I think you're right, recognizing human comprehension as a mapping and modeling process rather than a grasping of essence seems like an utterly reasonable starting point for a philosophical stance. These are iconic discussions in that regard and remain interesting and relevant from my perspective. Well done. Happy holiday! Thank you Coert. I did not know the remark of Bateson on the map. Where did you find it?